If you’re into keyboard switches, you’ll appreciate news that the latest version of Razer’s BlackWidow gaming keyboard adds a third option—the silent, low-travel Razer Yellow switch. Me, I’m just excited about the magnetic wrist rest. Riding on the success of the dual mechanical/membrane Razer Ornata, the new BlackWidow V2 is sporting a padded wrist rest that attaches magnetically to the front of the unit, which has quickly become one of my favorite things. Sporting angled edges, the comfy home for your wrists and part of your palms really ties the keyboard together. This keyboard is naked and should be ashamed of itself. This keyboard is properly rested. I do not have a picture of the Yellow switches, but the official announcement promises that they’ll be an option for the V2. They even explain why one might want them. The new version of the BlackWidow does not feature that dumb stylized font they used to use, where the R was an L rotated 180 degrees. 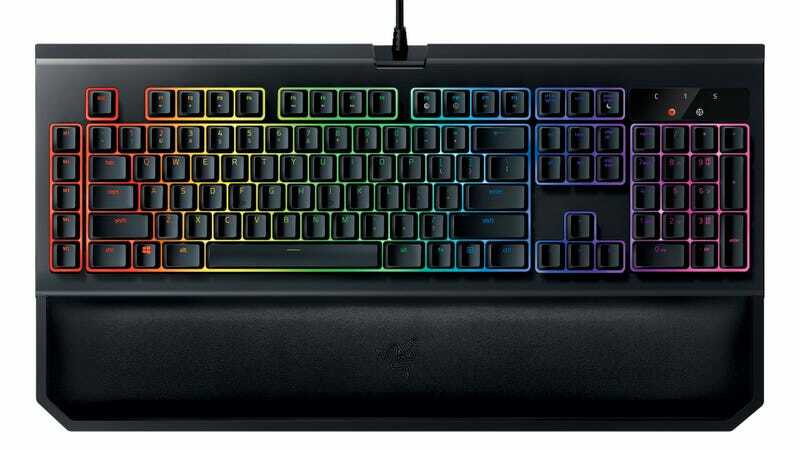 It does feature Razer Chroma, so you can make all of the keys glow Yellow, Red or Green to match your switches, or any of the other 16.8 million color options. Best of all, the Razer BlackWidow V2 costs the same $169.99 as the previous model. That means the wrist rest is free. Here are the features of the BlackWidow V2 in convenient bullet list format. Read that while I go back and make sure I didn’t type BlackWindow over and over again by mistake.